The Red-tailed Amazon (Amazona brasiliensis Linnaeus, 1758) is a parrot belonging to the order of the Psittaciforms (Psittaciformes), family Psittacids (Psittacidae), and genus Amazon (Amazona). The common name in Italian is Coda rossa, in German, Rotschwanzamazone, in French, Amazone à joues bleues and in Spanish, Amazona colirroja. After some taxonomical biologists, the species Amazona brasiliensis together with the subspecies Amazona dufresniana dufresniana and Amazona dufresniana rhodocorytha (which do not come from its lineage), might form a super-species. The Red-tailed Amazon is enlisted in the appendix I of the Washington Convention of 1975 (Convention CITES), which forbids its trade. For the IUCN, it is a species at high risk of extinction, therefore present in the red list; the residual permanent population, during the last years, has had a dramatic decrement, due to the continuous deforestation and seizure, for then being sold as ornamental bird. Presently, there is an estimation of only 2.000-3.000 specimens! Initially, this species of parrot was localized in all the south-east of Brazil, from the south-eastern area of the state of Sao Paulo, up to the Rio Grande do Sul. Nowadays, it is found confined in the Atlantic Forest, in the area corresponding to the typical tropical Brazilian coastal forest and in few other areas of coastal tropical forest in the states of Sao Paulo and Paraná. 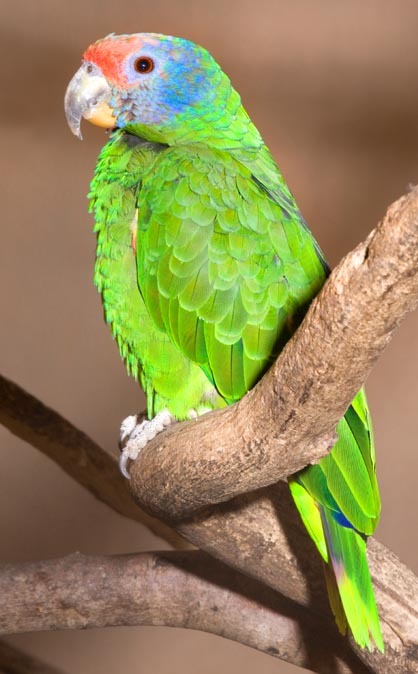 These parrots lead and arboreal life in the Atlantic Forest (the coastal pluvial portion), up to 200 m of altitude above the sea level; they are found also in the areas of seasonally flooded forest and in a permanent way, like in the mangroves. In this regard, they have a complex alimentary ecology, as they nourish of fruits (for instance, of species such as the Syagrus romanzoffiana, the Psidium cattleianum and the Calophyllum brasiliensis), of seeds and of nectar they collect, by means of their rough tongue, from the corollas of the flowers on the trees. At times, they eat also grubs, bugs, worms and insects. The green is the dominant colour of the plumage. The front and the temples are bevelled in red; the structure of the feathers in this area is particular, as they suggest a morphology which, in its whole, recalls the structure of a blackberry. The top of the skull and the scruff are bordered of red-pink and lilac-blue; the chin and the cheeks are blue-reddish. The feathers covering the ears are bevelled and of blue-violet colour, the wings are bordered of red. The secondary coverts on the body are green, but at their extremity they become dark blue. The tail is green, with greenish-yellow tips; the tissues and the most external rectrices are blue. A wide red belt marks the tail. The periophthalmic skin is grey, the iris is orange and the zygodactylous feet are grey. There is no phenotypic sexual dimorphism between males and females, neither seasonal-transitory, nor permanent. The pullets, like the immature individuals, have less red on the front and a more eclipsed plumage, whilst the iris is dark. Both males and females measure about 37 cm, weigh about 400-450 g and may live up to 40 years when in the wild. These birds carry on a life in pairs, but may live also in flocks. These associations are bigger during the winter, reaching even the 400 units; the Amazona brasiliensis in the past, was often observed in group with the Red-spectacled Amazon (Amazona pretrei). The Red-tailed Amazon often forages in the thick pluvial forests, whilst tends to localize its resting perches in the coastal forests. The ornithological biologists have observed that these parrots initially tend to nourish in the morning for about one hour, from 0900 to 1000, in the coastal forests where they have overnighted, and then fly off to the inner forests, looking for other alimentary sources. They then go back, by 1700 hrs to the coastal forests for going to rest on their relevant perches. Here they are really noisy, because they often compete for getting the best position where to rest. They keep silent after the sunset, whilst they emit sharp cries during the flight. This one is often irregular, but during the long journeys, as for the August seasonal migrations from the coastal forests to the hinterland ones, they may trace ample bends on the sky, giving loud vocalizations. The mating season, both in the wild and in captivity, falls from September to March. The male builds up the nest inside the holes created by the woodpeckers or in the hollows of the taller trees, especially palms, at an average height of 8 m. The reproducing areas are mainly placed in the pools, the thick forests and in the flooded ones. The zoological biologists have identified some arboreal preferences in the red-tailed Amazon, in particular for the above mentioned palm Syagrus romanzoffiana and the floral plants of the genus Calophyllum, family Calophyllaceae. In these plants, the nest is implanted in 50 cm deep hollows. If not destroyed, the same nest will be repeatedly utilized by the same pair every year. At times, the nests may be built inside big termite mounds, or close to big roots of several species of bromeliads. The woody coastal areas may contain a concentration of nests up to 7 per hectare (about 3 per acre). The seasonally flooded forests may reach the 18 per hectare (about 7 per acre), whilst the permanently flooded ones may have 39 nests per hectare (about 16 per acre). During the courting, both male and female raise the feathers of the head and widen the tail feathers. Two to four eggs are laid per each brood. At the most, three pullets are raised at the time. This means, unluckily, that if the newborns are four, one will be left to die without being nourished by the parents! The pullets are fed for 50-55 days, then will fly away to carry on their autonomous life.